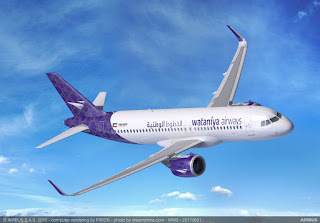 Golden Falcon Aviation, the exclusive aircraft provider of Wataniya Airways has signed a Memorandum of Understanding (MoU) for 25 Airbus A320neo Family aircraft. 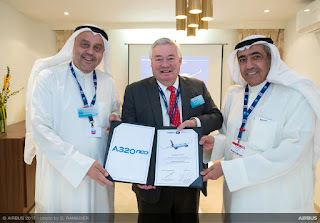 The agreement was signed earlier this week at the Dubai Airshow 2017 by Dr. Hamad Al-Tuwaijri, Chairman of Golden Falcon Aviation, and John Leahy, Chief Operating Officer Customers, Airbus Commercial Aircraft in the presence of Ali Al Fouzan, Chairman of Wataniya Airways. Wataniya Chairman Ali Al Fouzan: "We are looking forward to upgrading and further enhancing our fleet. The A320neo Family will offer our customers the most comfortable and modern cabins with 18-inch wide seats whilst ensuring profitability and efficiency. The addition of the aircraft will enable us to further strengthen our network as we continue to serve our valued customers”. “This new order of 25 A320neo Family aircraft demonstrates the confidence in our leading single-aisle aircraft,’’ said John Leahy, Chief Operating Officer Customers, Airbus Commercial Aircraft. “Its operational efficiency and unrivalled passenger comfort make it the perfect choice for Wataniya fleet expansion and growth plans.